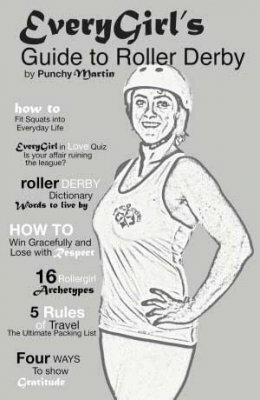 ﻿ EveryGirl's Guide to Roller Derby (Book) - $9.99 : Bruised Boutique, For Derby. By Derby. EveryGirl’s Guide to Roller Derby is a pithy guidebook about the culture of roller derby, which is meant to celebrate the resurgence of the sport of roller derby, an era when thousands of women united to recreate a sport. Roller derby encompasses third-wave feminism – a movement that celebrates the uniqueness of women, but is not embraced in American society – and the sport’s rapid growth is a sign that women all over the world in search of “something” have found it in roller derby. Pairing a no-nonsense tone and the culture of roller derby as the only subject matter, this guidebook aims to use humor as a means to tackle serious female issues. These include: body image consciousness, lack of confidence, miscommunication and fatalism. It pokes fun at traditional ways of viewing womanhood in attempt to make the reader hold a mirror to herself and laugh, rather than despair. I researched guidebooks written for women and found one that posed as the ultimate: EveryGirl’s Guide to Life, by Maria Menounos, published in 2011. The author’s guidance encouraged an admirable do-it-yourself philosophy and optimism that you can make anything happen, even with few resources. I was with her until I read a little further and found that do-it-yourself meant getting through life without hiring a make-up artist or personal trainer. The superficial content read like a regurgitation of advice from Cosmo and Martha Stewart magazines. I decided to write a guidebook, modeling it after the EveryGirl’s Guide to Life and sticking with the do-it-yourself perspective and general themes – health, beauty, travel – except my EveryGirl is a roller derby skater, and my society is the culture of roller derby.